Homespun Stitchworks..... For the love of vintage: Florence Caulfield........ Embroiderer and specialist in flora. Florence Caulfield........ Embroiderer and specialist in flora. Have you ever seen any embroidery of Florence Caulfield? Well if not there is an exhibition in the V & A in London. Florence Caulfield was an incredible embroider and specialist in South African flora. Florence arrived in London in 1909 and had her photo taken in a beautiful dress that she herself had hand embroidered with a grape design, it is simply stunning. Florence then set about organising an exhibition of her 52 'needle paintings' at the Horticultural flower show. Some of her pieces were purchased by Queen Alexandra and the princess of Wales ( later Queen Mary) and with this success another exhibition of her work was shown before she returned to South Africa in 1910 when she started to write her book. The book included line drawings of her patterns, some designs were naturalistic, whilst other works were in an Art Nouveau style. Most of Florence's work was in satin stitch and she preferred to stitch without a hoop. The illustrated needlework book was due to be published in 1914 but it seems that the out break of World War 1 may have stopped it going to press! The needlework exhibitions in the Victoria and Albert museum are wonderful......take a look, worth a day visit if you can. 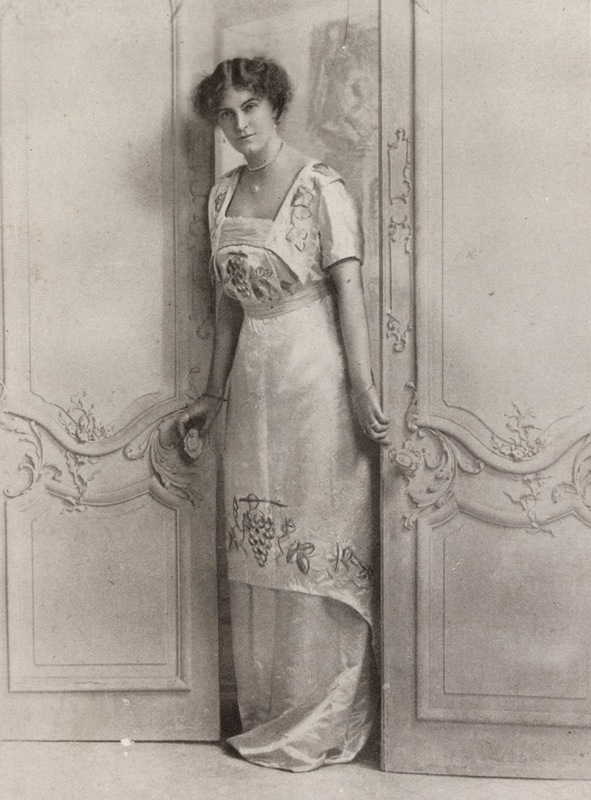 Florence Caulfield in her hand embroidered dress.